They are as American as baseball and apple pie: The U.S. film and music industries lead entertainment trends throughout the world and remain the benchmark to which other countries efforts aspire. Along with other copyright industries, they contribute billions of dollars to the U.S. economy, outperforming other sectors and playing an increasingly leading role in the growth of exports. Two GW alumni lead these industries in top positions. While there may be nothing more American than Hollywood, theres nothing more GW than a prime lobbying jobespecially in Washington, where one of these men leads his organization just a few blocks from campus. They both have one other common bond. Their industries have been threatenedby the same technology that also spreads their good work all over the world at lightning speed. Both men discuss that threat here, along with how they ended up in the middle of this fight for their industries lives. Former Agriculture secretary turned Motion Picture Association of America President Dan Glickman, JD 69, relishes the challenges ahead. When the news broke last summer that Dan Glickman had been tapped to replace the legendary Jack Valenti as the next Hollywood ambassador to the U.S. government, more than a few movie industry observers expressed feelings of overwhelming befuddlement. With George W. Bush in the White House and strongly favored to remain there, and with the Republicans firmly in command of Congress for the foreseeable future, why would the moguls of the Silver Screen choose a former Democratic congressman from Kansasand a former secretary of Agriculture, of all thingsto be their next Capitol Hill point-man? An unlikely sounding scenario? You bet. Before deciding to retire last year at age 82, the impeccably groomed and fiercely charismatic Valenti had spent 38 years as one of the nations most effective lobbyists. Secure in the power of his trademark smile, Valenti by 2004 had become a Washington institution. Before departing the scene, however, the lobbying legend would apply his persuasive power to one final task: choosing his replacement. 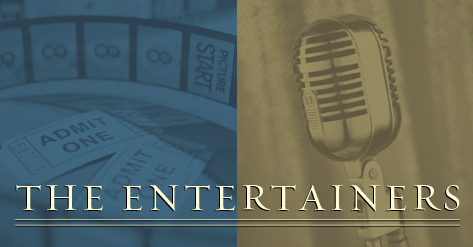 Who would win this coveted job as the high-powered voice of the motion picture industry? 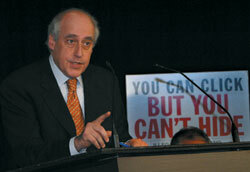 the longtime farm-state legislator from Wichita: Dan Glickman! 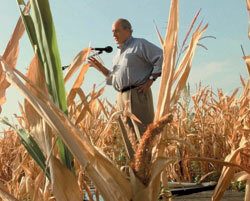 Dan Glickman stands in the Arterberry farm outside Newcastle, Okla., in July 1998 during a tour to see the effects of that summers drought. Glickman served as Agriculture secretary from 1995 to 2001. Glickman himself often sounds surprised to have landed his new high-profile job as the Hollywood PR Czar. A few weeks after I was chosen to head the association, he told GW Magazine in a recent interview, the editors at The New York Times decided to run a profile of me. When the piece appeared a few days later, I noticed that on the left-hand side of the page was a big picture of Jack Valenti with [famed Italian actress] Sophia Loren at the Cannes Film Festival. On the right-hand side, they ran a photo of me and [87-year-old] Senator Robert Byrd going through some cornfield in West Virginia. While touting his heartland credentialsI represented the reddest of the red states, and the movie people are well aware of thatGlickman also points to his track record during nearly six years (1995-2001) in the top job at the Department of Agriculture. I had to manage 100,000 employees and a $70 billion annual budget on that job, and I like to think I met the challenge, he says. After spending the past six months answering the same basic question from reportersWhy did Hollywood pick you?Glickman has assembled a list of reasons why his selection made very good sense, at least from Hollywoods point of view. Valenti is one of these reasons. Valenti hasnt made this point public, but everyone in the industry understands that Valenti had total veto power over the selection and that he leaned toward Glickman because of his political and international trade experience (especially with China). It didnt hurt, either, that former Lyndon B. Johnson aide Valenti waslike Glickmana passionate Democrat. During 18 years in the House of Representatives, Glickman became known for an ability to work both sides of the aisle to gain nonpartisan support to push important legislation through the pipeline. He also knows U.S. copyright law inside-out and the Byzantine process that will be required to get new anti-piracy laws through Congress. While serving for many years on the House Judiciary Committee, he specialized in technical and intellectual property ownership issues. His legal skills will aide the MPAAs number-one requirement in 2005: finding a way to stop the movie pirates, who are stealing an estimated $3 billion from the big studios each year, Glickman says, by copying VHS tapes and DVDs, and downloading and file sharing movies at an alarming pace. Glickman also has personal links to the movie industry. His son, Jonathan, is a Hollywood producer, with comedies such as Shanghai Knights and the Rush Hour series to his credit. In addition, Glickmans wife, Rhoda, was, for 15 years, the director of the Congressional Arts Caucus, where she coordinated Capitol Hill movie screenings hosted by Valenti. In November in Los Angeles, MPAA President Dan Glickman warns that his industry plans to sue people who illegally distribute movies online. One veteran Washington insider who says he wasnt at all surprised by Glickmans ascension last July to his $1.5 million-a-year MPAA post is Sen. Pat Roberts (R.-Kan.). After working closely with Glickman on farm legislation for many years and watching him run the Department of Agriculture with a firm, steady hand, Roberts says he was quick to give the former Clinton cabinet member a very positive reference when the MPAA recruiters called him for a candid assessment of Glickmans administrative and political skills. I dont always agree with Dan, but I gave him a great reference, anyway, joked the longtime Republican. I told them that even though hes a Democrat, I recommend him highly. It used to be said that [running] Agriculture is the toughest job in Washingtonand I told the headhunter that if Dan could handle that job, I dont think hell get ambushed at the MPAA. As a young boy in Wichita, Glickman couldnt get enough of the moviesand of that delicious, aromatic popcorn they sold in the lobby of our neighborhood theater, he says. The movie house was the Crest, located six blocks from Glick-mans boyhood home. Glickman says he rarely missed a Saturday afternoon in that magical setting, where dreams came alive on the screen and you could escape from the everyday world for a couple of hours, just by purchasing a 25-cent ticket. you have to remember that TV wasnt as big a part of our lives as it is now. For us, going to that movie theater was a big, big thing. These days, after six months on the job at MPAA, Glickman says hes having more fun than he ever expected. Its true that I face a lot more stress here than I did at the Department of Agriculture, he points out, even though Ive only got about 250 employees and a budget in the tens of millions [of dollars], instead of $70 billion. Another pleasant job perk, Glickman says, is the opportunity to rub shoulders with megawatt movie stars now and then. So whats it like to spend an occasional hour or two in the company of folks like Jack Nicholson, Brad Pitt, and Julia Roberts? Does the former Kansas farm legislator ever feel shy or intimidated around these world-class celebrities? Oh, I dont think so, Glickman chuckles. You know, Ive lived long enough to know that you just cant let yourself be intimidated by people, including movie stars. In my line of work, what you end up learning is that most people are pretty much the samesome are more beautiful than others, thats all. Neil Portnow, BA 71, knows a thing or two about the music biz. For Recording Academy President Neil Portnow, the long climb to the top began with a GW bullhorn. It happened on a crisp fall afternoon in 1969, when the president of the GW Student Associationa charismatic senior named Neil Portnowdecided it was time to get negotiations started, before a complete riot broke out at Maury, then a frequent target of anti-Vietnam War demonstrators. 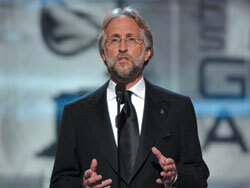 Neil Portnow addresses the audience and millions of TV viewers during the GRAMMY Awards in February. On that breezy autumn afternoon, Neil Portnow spent nearly an hour in the window of Maury Hall, doing his best to broker some crucially important negotiations between outraged student demonstrators and administrators who were doing their best to keep their university functioning at the height of the Vietnam War. Attending GW in the late 1960s and early 1970s was an amazing experience, says the 56-year-old Portnow, today the president of the National Academy of Recording Arts & Sciences Inc. (known as The Recording Academy). From one hour to the next, you didnt know if the school would even remain open for classes. Washington was full of anti-war activists, and life on campus seemed increasingly chaotic. Of course my own personal politics were left of center. Id been in several peace marches, myself. At the time, however, I was serving as student body president, which meant I had a responsibility to keep the lines of communication open to the University administration. In some ways, I saw myself as an undergrad version of Henry Kissingera negotiator whose task was to try and get everybody to cool the rhetoric and stand down a notch. At the same time, though, I was also urging the administration not to overreact by bringing in the D.C. police and the tear gas. Since then, he has spent more than 30 years in the music businessas a performer, as a marketer, and as an administrator. I do think the ability to negotiate between different groups is the key to any success Ive been able to achieve, he says. As a hugely successful record company executivethink Zomba, Arista, EMI, RCA, and Twentieth-Century FoxPortnow long ago proved he had the magic touch required for selling millions of songs by such superstars as Whitney Houston, Britney Spears, the Backstreet Boys, and R. Kelly. These days, just about everybody in the music business knows that Portnow has an extraordinary ability to negotiate between the big-time music creators (including such over-the-top writer-producers as Max Martin, Robert John Mutt Lange and Teddy Riley) and the tens of millions of worldwide music consumers who pay the bills. Indeed, The Recording Academy acknowledged Portnows obvious talents as a marketer and manager when it tapped him in 2002 to replace the legendary C. Michael Greene, who had just departed the 18,000-member Academy after 14 years as its often outspoken and controversial chief executive. Neil Portnow stands in the middle of a star-packed linuep after reading nominations for the 2003 GRAMMY Awards at New Yorks Madison Square Garden. (from left:) Ashanti, Avril Lavigne, Nelly, John Mayer, Neil Portnow, Cyndi Lauper, Kenny Chesney, Jimmy Jam Harris, and Justin Timberlake. A bit more than two years after his selection, Portnow continues to prove that the industry execs who backed his candidacy got it right. Under his steady hand, the Grammy® Awards music specialby far the biggest enterprise launched by the Academy each yearhas improved dramatically, according to most of the national critics. Ask key industry figures such as RCA Label Group Chairman Joe Galante to evaluate the yearly shows, and many will tell you that last Februarys extravaganza (featuring the irrepressible Queen Latifah as emcee and other stars such as Green Day, Kanye West, and Alicia Keys) may have been the best-produced Grammy spectacle in the entire 47-year history of the event. Portnows influence isnt limited to the big recording studios where writers and performers spin their magic. Ask California congresswoman Mary Bono (shes from Palm Springs, and she knows a thing or two about music) to describe Portnows performance as a member of her recently formed Recording Arts and Sciences Congressional Caucus and the well-known widow of former singing star Sonny Bono wont hesitate. Neil is a powerful advocate for musicians and writers in America, says Bono, who co-chairs the caucus and passionately supports its mission to protect the rights of musicians, songwriters and singers from copyright pirates who illegally download music from the Internet. Neil does a great job on that issueand he also understands the complexities of the [Capitol] Hill, she says. In his job as Academy president, he has to negotiate between two worlds that are often at odds: Hollywood and Washington. But he does it very well. His communications skills seem to be naturalhes charismatic and also extremely knowledgeable. Most people in the music business know Portnow for his skill as a creative executive, marketer, and negotiator. But only a few of the performers he represents know that the Academy president, himself, once dreamed of topping the charts as a bass player and guitarist. For Portnow, who grew up in the middle-class community of Great Neck on New Yorks Long Island, the musical passion began in earnest one night in the mid-1950s, when a brand-new phenom named Elvis sang a tune called Hound Dog on the Ed Sullivan TV show. I was raised in a family that had a great love of music, he says. As soon as I was old enough as a child, my parents started taking me to performances by the Great Neck Symphony Orchestra on Sunday nights. And at first, it was: Aw, momdo I have to go? But pretty soon I started getting excited about music, all kinds of music. And about the same time, I caught one of those Ed Sullivan Shows with Elvis, and that did it for me. Hound Dog! And I started bugging my parents for a guitar. I was eight years old, and I was already asking for guitar lessons. What followed, of course, was a remarkable run as one of the most successful music executives in the annals of contemporary music. By the late 1990s, the fleet-footed Portnow had risen to senior vice president of operations for the giant Zomba Group on the West Coast, where he also spent a lot of time as a volunteer leader for The Recording Academy. As the point man for the 18,000 music writers and performers in his organization, its his responsibility to lead the battlein Congress and elsewhereto prevent further erosion of music copyrights and intellectual property rights in this country, due to the high-tech banditry that he says is now occurring daily on the Internet. Right now, the Academy is doing its best to educate peopleand especially younger peopleabout the importance of respecting copyrights, and that isnt easy. One of the problems has been that its quite easy for the kids to go out and buy high-tech equipment that allows them to do the [illegal] downloading and file sharing. Is Portnow confident that the pirates can be stopped, and that the future of commercial music in America remains as bright as ever? You bet, he says. Im a real optimist when it comes to thinking about our industrys future. Lets face it: Good music is more available today than ever before, and millions of consumers worldwide are enjoying it on a scale never seen before. When Neil Portnow took the stage at the Grammy awards this year to deliver his annual speech as president of The Recording Academy, he was doing his part to fight music piracy. As part of a promotion for a star-studded tsunami relief song, he touted the availability of the song on iTunes, a legal venue for downloading music on the Internet. While Portnows industry was the first to face the threats that piracy, particularly the newer threat posed by illegal downloading from the Internet, Dan Glickmans motion picture industry shares the same challenge. For both men, the issue is at the forefront of survival of the businesses they represent. In the past, copyright piracy has been a much bigger problem for the music industry than for Hollywood, Glickman said about his industry in December, just after announcing that the Motion Picture Association of America had just filed dozens of lawsuits against Internet thieves who allegedly steal Hollywood movies and then share them online. But with the rapid development of movie-replicating and file-sharing technology, all of that is about to change. Both men are watching an impending decision from the Supreme Court, which in December agreed to review a key case that likely will determine whether such Internet-based file-sharing enables as Grokster and Morpheus will be held financially responsible for losses, if their services are found to have contributed to movie piracy. At this magazines press time, the Court was scheduled to review the case in late March. On the music side, much has changed since services like Napster first came online a few years ago, offering Internet surfers free access to music downloads. These days, Napster is a revamped, fee-based service (as is the Mac-based iTunes), that allows users to buy song downloads for 99 cents and albums for $9.95. For its part, GW, as part of a select group of universities, is participating in a pilot program for the 2004-05 academic year that allows 7,100 residence hall students to have complimentary subscriptions to Napster. GW also monitors network traffic to enforce legal downloading policies. It was the music industry that first began the barrage of lawsuits within the past two years aimed to curb Internet piracy. The lawsuits sent America a powerful message: If you are file sharing copyright-protected music, you are breaking the law, says Mitch Bainwol, chairman of the Recording Industry Association of America (which represents the record companies), who is Portnows Washington counterpart in the crusade against illegal downloading.